I knew I wanted to open a food truck after experiencing delicious street food in Seattle. 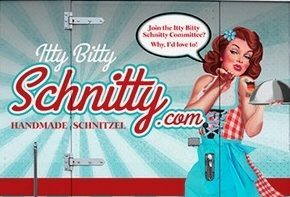 It was a long road researching, building and conceptualizing our schnitty truck. It wasn't just about filling the bellies of our beloved WA peeps, I wanted to share something special, something from my childhood that gives me a sense of comfort. So, I decided to bring my family to yours! My mom was born in Germany but our family lives in Austria with extensive roots. Every time my family visits Austria we devour schnitzel - it's a tradition and a staple in our culture. We knew we needed to bring this savory dish to the masses. Although we can't share Mutti's secrets, we are excited to share the love - the love of schnitzel...one Itty Bitty Schnitty at a time! Let us know if you have a favorite menu item! Daily specials come and go so make sure to contact us if you can't live without one!